The remarkable KPOP boyband BTS has announced another set list of their world tour. Starting their Love Yourself Tour in August 2018 in their motherland Seoul, it will be ended in Bangkok April 2019; BTS is already gearing up for another world tour. Visiting 20 cities in nine months, the bulletproof boys are definitely have a lot of things on their plates. Through their official website on February 20th, Big Hit Entertainment announcing another set list of the BTS world tour called, Speak Yourself. Featuring six stadiums around the world, it is official that the seven membered group will be officially doing their stadium tour. This tour would promote the boys’ upcoming album that rumour has it would be released sometime in May. 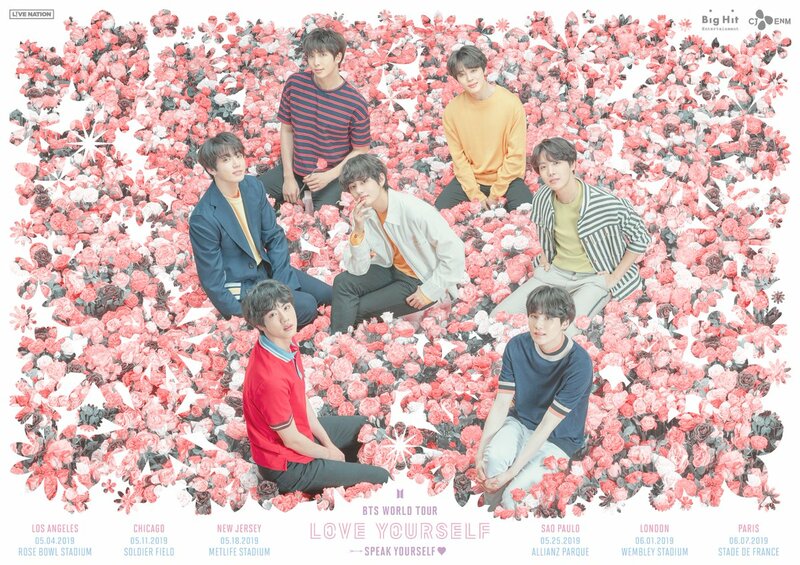 As for now, the boys will be visiting the world class stadiums, such as the Rose Bowl Stadium in Los Angeles, Soldier Field in Chicago, Metlife Stadium in New Jersey, Allianz Parque in Sao Paulo, Wembley Stadium in London, and Stade de France in Paris. The Speak Yourself tagline is added under the title Love Yourself, and being put under a special category on the website. As they mentioned that there will be more dates to come, just keep your fingers crossed to see the boys in your country.